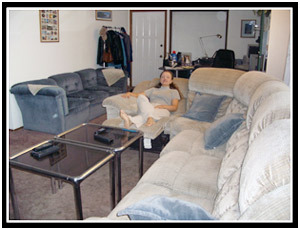 Who would have thought that replacing one sectional couch with another would be such a hassle? Oksana and I have been looking for a fancy new couch for a while now. After researching prices online, at local furniture stores, and in the daily want-ads we rapidly came to the conclusion that we couldn’t yet afford a new one with all the most desirable features. It seems that things like recliners, cup holders, and hidden compartments for remotes add up to a healthy price tag. We never even got into the vibrating cushions and built-in mini-‘fridges. Not that our old couch is all that bad off. In fact, for the $70 we paid for it a couple years ago, it’s outstanding! Unfortunately it only comfortably seats about 5 people and for the last year and a half we’ve had at least 8 people over every Friday evening. Good hosts don’t make their friends sit on the floor – or at least they feel guilty when they do. As luck would have it, one of our friends was recently planning to sell their couch at a garage sale. At half of what they originally paid for it, we still thought it was too expensive, but when they realized we were interested, they offered it to us for about 1/3. We really had to stop and think about that. Besides the money, the biggest problem was that even with a slightly bigger couch, we still wouldn’t be gaining any extra seats. If only we could be sure that we could find a way to arrange both couches (or at least parts of both) in our apartment, then we’d definitely commit to buying the new one. But we couldn’t be sure. Even after taking measurements and batting around placement ideas, Oksana and I just didn’t think it would work out well enough. Our apartment was small and we were worried about losing what little open space we had by inserting a high-backed row of seats. We were just about ready to tell our friends to go ahead and try to sell the couch at their garage sale when they knocked off a couple hundred more dollars. Now at one quarter of the retail price, we couldn’t pass it up. We’d seen some sectional couches for sale in the classifieds, but none of them went for that low. If we didn’t buy this one, we would probably have to resign ourselves to our beat-up blue sofa… at least until we started furnishing our own house. I arranged for some help, Oksana wrote a check, and Thursday after work, we tried to find a way to cram in 12 sections of sofa (not to mention one huge entertainment center, a giant desk, 3 coffee tables, a bookcase, a coat rack, and two old freestanding Sony speakers!) into our living room. That first evening, we gave up on trying to make it work fairly quickly. Since we had friends coming over the following evening, I arranged them into two plush rows in front of the TV. Although there were still a couple sections that weren’t even being used, we had almost no room left to maneuver through our house. That didn’t matter, though, because we had an awesome home theater arrangement! That night we even had two extra people there (Lena and her friend, Marina) and we still weren’t crowded. For once, no one sat on the floor. Unless you really like mazes, though, you can imagine why we decided not to keep it that way. On Sunday, Oksana and I started moving sections around (and around) to find the best way to maximize our seating arrangement. It took us awhile to agree, but we finally got there. We’ll still have to get rid of a few sections of the old blue couch and the high backs of the new one obscure a bit more of the sunlight that comes in through our windows, but at least now you don’t have to turn sideways to get in the kitchen. We still don’t have an integrated mini-‘fridge, but I sure can’t complain about the two built-in recliners. I’ve got a new, favorite reading chair! The reclyning section is reserved for me,right?